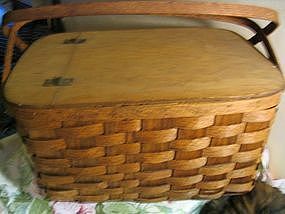 Vintage basket with original dinnerware set. The plastic dinnerware set includes 6 compartment plates, 6 cups, 6 forks, 6 spoons, 6 knives, 6 relish forks and 6 condiment/butter spreaders. All pieces, except relish forks and condiment spreaders, are marked with the Basketville logo. There are 3 brown of each piece and 3 ivory of each piece. There are no cracks, splits or chips on any of the pieces, but it is obvious they have been used. The basket measures 20" in width, 13" across and 11" in height. The height measurement does not include the handles. There are no problems or fraying of the weave and the handles have no problems. The inside of the basket is clean, with no mold, which is a problem with older baskets. The inside of the lid is just fine and the elastic utensil holder is in place and functional. The outside of the lid has some scuff marks and one tiny area at the edge of the lid which looks like a TINY superficial nick which does not extend all the way through. I need not say to you collectors, how unusual it is to find all of the dinnerware pieces. If you have any questions, please email. I need your zip code to calculate the postage.